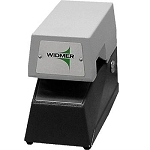 This machine will permantly perforate your documents, providing that extra degreee of protection you need. 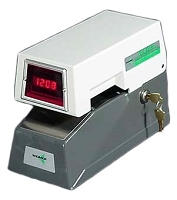 Equipped with a full range of characters, dates, numbers, cancellations, logos and symbols that are available for permamently marking documents and for numbering, authentication or security purposes. The best form of protection for permanent and unalterable marking of documents- perforated holes can't be erased! Applications include: Dating, Numbering, Cancelling, Coding and Validating for Invoices, Documents, Claims, X-Rays, Credit Cards, Badges, Passports, Etc. Rugged Construction: made of heavy duty aluminum alloy die casting. Completely enclosed gears and motor bearings are lubricated for life. All steel punches and die plates. Encased in plastic case for economical pricing and shipping. Various styles and options available. Electronic perforators for Dating, Numbering, and Cancelling. 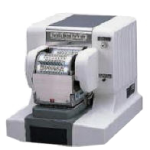 PIN SELECTOR TYPE: 8-Digit Dating/Numbering, 10-Digit Dating/Numbering, Paid and Date (8Digits), Upper Line and Date (8Digits), Two Lins and Date (8 Digit), Can perforate up to 20 pages at once.